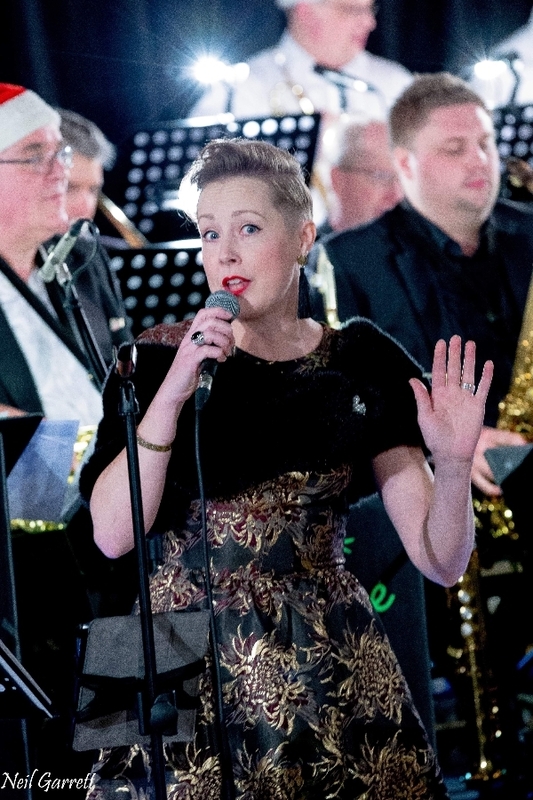 On Tuesday Feb 26th the SJO Big Band will be joined by amazing jazz vocalist Georgie Fellows at the Village Hall in Jacobs Well. Daughter of actor Don Fellows Georgie brings songs to life with an explosive and energetic style. Now in their 50th year of playing great big band tunes the SJO are delighted to have Georgie join them. Musical Director Pete Deane says --- " We have worked with many vocalists over the years - but Georgie brings great musical enthusiasm to everything that she does -- this is a night not to be missed "
Well it's Xmas -- we will be donning our party hearts and playing swing versions of your favourite Xmas Carols and songs. Playing music in the idiom of Count Basie and others you can hear the likes of Silent Night etc . The SJO Big Band will be playing a great range of swing and big band jazz tunes providing support for fundraising for the Children's Trust. Featuring the Frank Sinatra/Bobby Darren type vocals from Steve Bailey we will be wowing the audience with a great range of tunes and songs! The SJO Big Band will be celebrating it's 50th birthday in 2019 and there are many members of the band that have been part of this great musical experience for a significant part of this time - helping to make great music! Ticket sales for Jazz in the Green on October 27thare going well – so if you are interested in listening to and seeing the SJOBig Band - an amazing swing/jazz band then you should call and order yourtickets now. With a long pedigree of playing great music from the bigband era – both ancient and modern – and with Jeremy Lassen featuring vocalsfrom the likes of George Michael, Frank Sinatra as well as Buble and Manilow –not to mention a drummer once voted the European Jazz Drummer of the Year thisis a band not to be missed. Great live music in the heart of Englefield Green. Great Live Music - Jacobs Well -- Big Band Concerts... real swing music! In aid of Shooting Star Chase Hospice!! SJO Launches Charity Fundraising Initiative. I am pleased to announce that on Tuesday October 30th that the SJO Big Band will be playing a concert in support of raising fund for the Shooting Star Chase children's hospice charity -- to help raise funds for that charity. As part of this collaboration we will be both enlarging the audience for the SJO Big Band as well as raising a charitable contribution for Shooting Star.! We are really excited about the extra dimension theseorganisation will bring to us here in Jacobs Well – and to being able to do onesmall thing to help them. We look forward to your continuing to support us andthese charities. The SJO Big Band continues to play fantastic swing concerts at the Village Hall in Jacobs Well - and will feature vocals in the style of Frank Sinatra/Bobby Darren with veteran vocalist Steve Bailey. 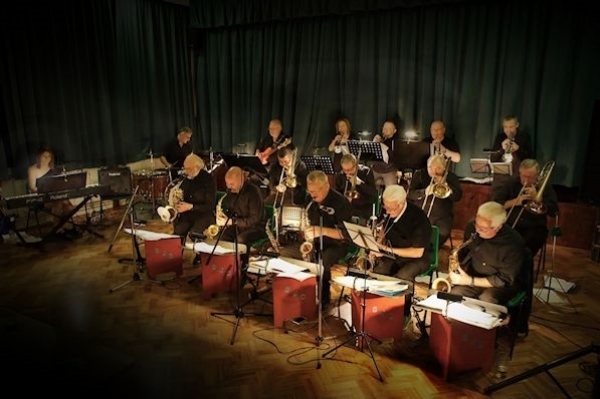 Having played together for many years the SJO Big Band present a crisp style of swing/ big band music in the style of many of the well known bands such as Count Basie/Duke Ellington. 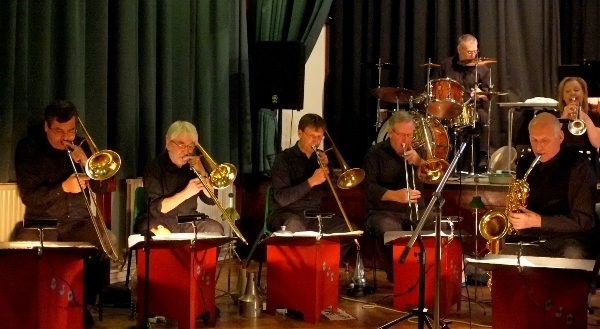 Every last Tuesday of the month the SJO entertain audiences at the Village Hall in Jacobs Well -- and give a brilliant opportunity for fans to listen to live music played by highly talented local musicians. The next dates for the concerts are October 31st/ November 28th and December 19th. Concerts start at 8pm and finish at 10.30. The SJO Big Band continues to delight audiences with it's monthly concerts at the Village Hall in Jacobs Well on the last Tuesday of every month. On Tuesday Sept 26th the band embarks on its Autumn Series of concerts - playing favourites tunes in swing/big band style. Following the retirement of Worplesdon music veteran Mike Wilcox, Pete Deane takes on the leadership of the band. Pete says " We will build on our previous successes -- we already have some new talent in the band --but continue to delight our followers with some of the tunes from the memorable Count Basie Duke Ellington era as well as some of the modern day greats. The Autumn Series of Concerts are on Sept 26th, Oct 31st, Nov 28th and a Xmas special on December 19th when the band will play swing version of your favourite Xmas tunes. 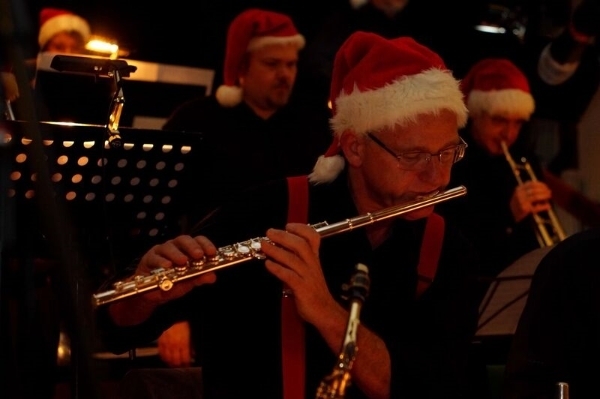 Having built up a following playing in the Surrey area for many years the SJO Big Band welcomes new fans to come and listen to and enjoy their music. 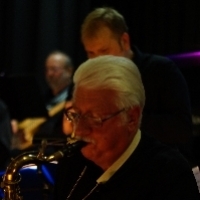 Mike Wilcox has lead the SJO Big Band for the last 20+ years. On July 25th at Jacob Wells he passes on the baton and plays his saxophone for the last time with this great band. This is a Concert NOT to be missed!!. The SJO Big Band (Surrey Jazz Orchestra) is renowned for thefantastic music that it creates and the passion and excitement that those thathear it gain – getting those toes tapping and bringing light into the lives ofthe audience. A real bunch of clever guys and gals! The SJO Big Band playa range of music and tunes from people that you will have heard of like CountBasie and Duke Ellington as well as some of the more modern swing stars. And you can have the chance to hear it – every month here in the Jacob Well’s Village Hall. The SJOBig Band perform a Concert on the last Tuesday of EVERY month – starting at8pm, with a small cover charge –they even have a son of one of the villageplaying with them from time to time. This is your chance to hear some fantastic live music - andsupport the activities in the Hall. And you can have the chance to hear it – every month here inthe Jacob Well’s Village Hall. The SJOBig Band perform a Concert on the last Tuesday of EVERY month – starting at8pm, with a small cover charge –they even have a son of one of the villageplaying with them from time to time.